In this op-ed for pv magazine, Taylor Sloane of Fluence outlines how system planners can use energy storage to predict load growth when developing transmission and distribution infrastructure. Increased rooftop solar penetration and energy efficiency are pushing electricity demand down while increased electric vehicle charging is pushing it up. This puts system planners in a difficult position because they must make 40 year investment decisions with imperfect information. 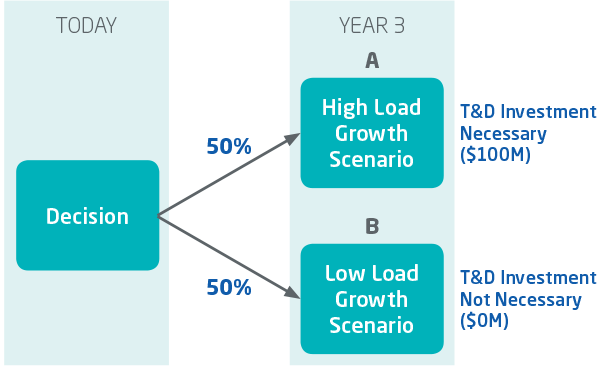 For the first time, system planners must contend with the possibility of stranded T&D assets for infrastructure built in the name of reliability for load growth that never materialized. In South Carolina rate payers were saddled with a $9B bill after two nuclear reactors were abandoned due to cost overruns and lower than expected electricity demand. Prudent system planners should be careful that the same does not happen for expensive T&D investments. Historically, ISO’s have had a hard time forecasting load growth. In PJM, for example, peak load forecasts have consistently overestimated future load growth (see right). 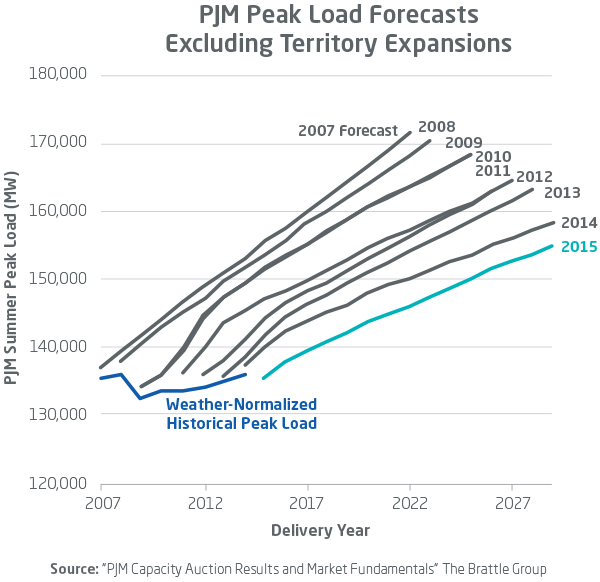 For years PJM projected that load growth was always just around the corner, but it never came. The consequence of overestimating load growth is that rate payers foot the bill for unnecessary generation capacity and T&D investments. 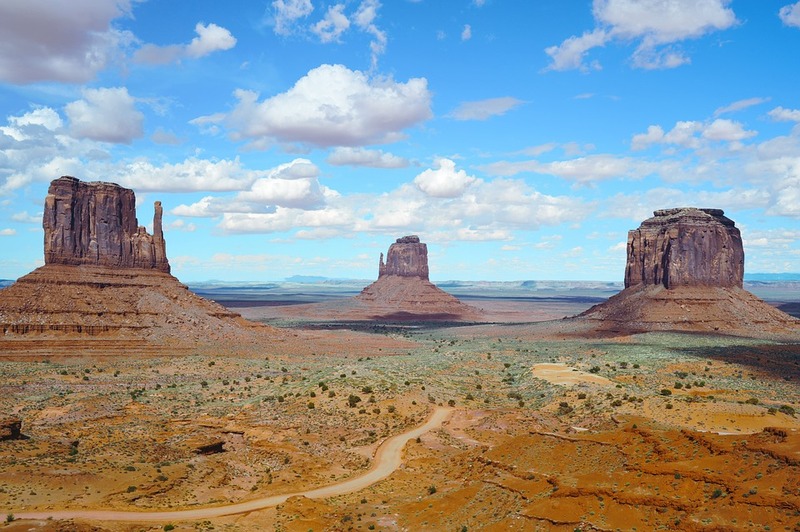 In 2017 Arizona Public Service (APS) built a 2 MW, 4-hour duration battery energy storage system for less than the cost of a 20 mile transmission upgrade—making them one of the first electricity companies in the nation to use battery-based energy storage in place of traditional infrastructure for basic grid operation. For APS, this new system will provide much-needed T&D capacity, saving them the time and cost of rebuilding lines and poles over difficult terrain. In addition, this energy storage system will provide additional benefits like voltage regulation and delivery of excess solar power, as well as the capability to add additional storage as needed, all at a similar cost. The project is a prime example of how energy storage can address local needs in areas experiencing population growth and associated load growth. Punkin Center is a growing rural community of 600 residents, roughly 90 minutes northeast of the urban core of downtown Phoenix. To increase power reliability for those customers, APS chose energy storage because of its faster speed of deployment, lower implementation costs, and the additional services it could offer. 1) Time value of money: Unlike traditional utility T&D investments, battery energy storage can be built in as little as 6 months, which allows investment cash flows to be deferred into the future. 2) Option value: Modular and redeployable energy storage allow utilities to only invest in what they need and eliminates the risk of T&D stranded assets. Time value of money and optional value are concepts that have been used for decades in the financial sector to manage risk when investors face uncertainty about the future. 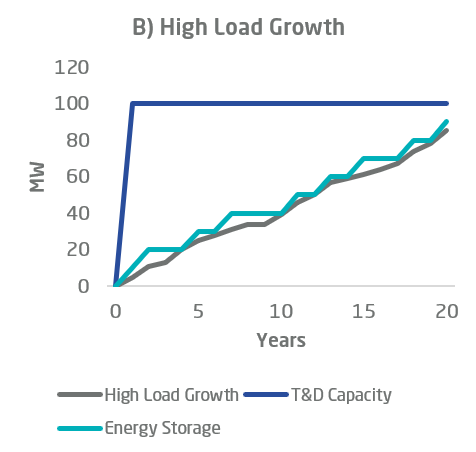 Energy storage can serve as a risk management tool for system planners to make T&D investment decisions in the face of load uncertainty to eliminate the risk of T&D stranded assets with rate payers left with the bill. Imagine a system planner must decide if it will have low, medium, or high load growth and is considering a 100 MW transmission line as seen in the graph A below. Often in situations like these, the utility must build the 100 MW transmission line in order to ensure reliability in case the high load growth scenario come to fruition. One of the advantages of energy storage is that it is quick to deploy and can be constructed in modular units so that capacity is not overbuilt for load. Using the same example as before, graphs B, C, and D illustrate how energy storage is constructed over time in order to meet the grid’s needs as they arise. The key advantages to this modularity is that utilities can take advantage of the time value of money by delaying investments as long as possible and only constructing what is needed. Additionally, in the event that a utility begins deploying energy storage but later realizes a T&D upgrade is necessary, the energy storage modules can be redeployed elsewhere. To give a sense of the magnitude of the time value of money, deferring a $100M project by 5 years and 10 years would result in a savings of $29M and $49M, respectively, assuming a 7% discount rate. Albert Einstein famously said “Compound interest is the eight wonder of the world”, which we can see here with the savings resulting from deferring T&D investments. 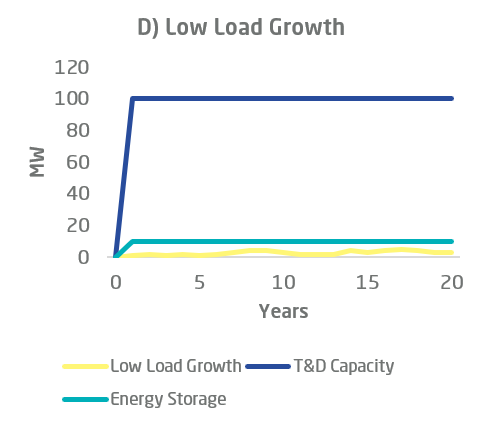 The second benefit of energy storage for T&D deferral is that it provides the ability to wait and see how load grows, which gives utilities optionality. Using similar techniques as are used on Wall Street, the value of this optionality can be quantified. Here is a simple example. 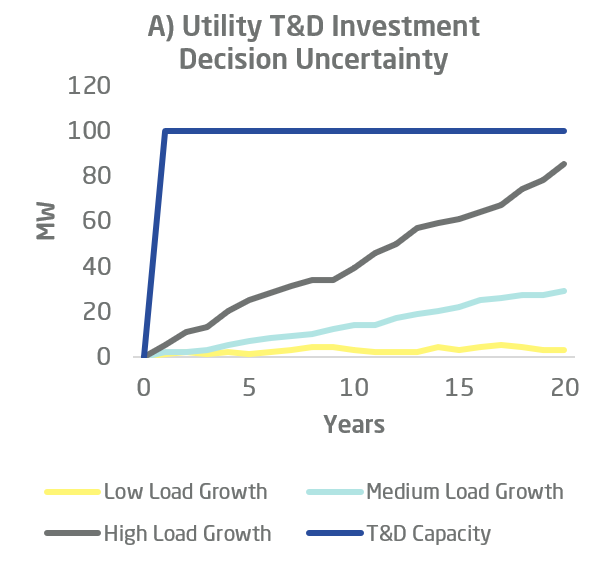 Utility ABC is considering a $100M T&D upgrade today based on forecasted load growth in 3 years and foresees two scenarios each with a 50% probability (see figure below). This model can become far more sophisticated to account for multiple time periods, but it illustrates how optionality is valuable. 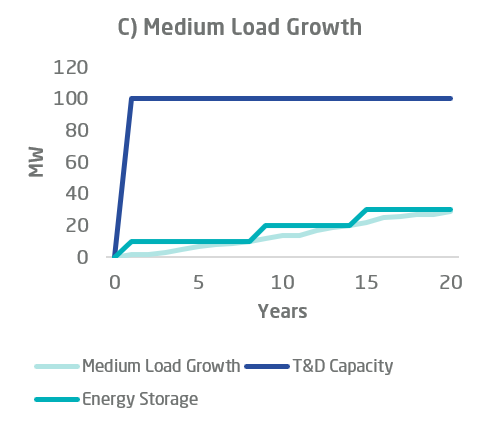 As can be seen above, excluding the benefits of ancillary services and renewables integration, energy storage is already less expensive on a net cost basis when compared to traditional T&D investment, even in the high load growth scenario. In conclusion, energy storage is useful tool system planners can consider when facing T&D investment decisions with uncertain load growth. This framework is intended to be a helpful guide to think about how to value energy storage in those situations. This article was first published on the Fluence Blog and has been republished with permission. Taylor Sloane is an Associate on the Market Applications team at Fluence. Taylor identifies markets and applications that are attractive for energy storage development.